“The buckets are not what they seem.” The well-known proverb has never been so right as in the following case of doppelgängers, endless corridors, and wooden buckets. 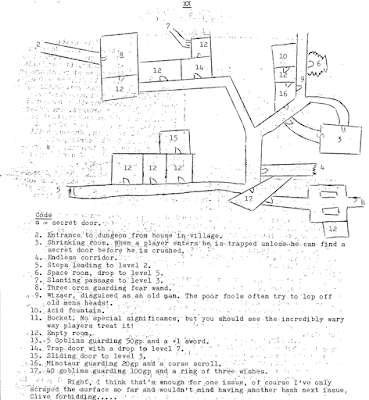 Actually, I stole the topic of this post from a G+ discussion, where Jon Salway posted the front page of a flyer Games Workshop used to promote OD&D in 1976, and Zach H followed it up with the reverse, displaying an example mini-dungeon called The Dungeons of the Ground Goblins, penned by none other but Steve Jackson (the Fighting Fantasy author, not the GURPS designer). Apologies in advance to everyone involved, but theft is a small price to pay for reposting this tiny piece of D&D history – and this is a story about theft anyway. Readers of this blog might remember a post from March discussing the early days of D&D fandom in Britain, as seen through the scanned issues of Chimaera, one of the country’s many Diplomacy zines. The pièce de résistance is found in issue #18, with an introductory article penned by one Paul Cook, a resident of the Isle of Wight, and containing a sample dungeon level offering a selection of the tricks and encounters you might find in your typical D&D game. I praised the level for its simple ingenuity, complexity and varied challenges, an obscure but cool example of early game design. Was it one of Paul Cook’s levels from Castle Hope, his personal megadungeon? Or was this a one-off to showcase the game for zine readers? Could there be more to it hidden away in an ancient campaign folder? Was Paul Cook still around somewhere to share it? Material like that invites a lot of speculation. Then I came across the post linked above, and it turned my theories right on my head. Looking at the two sample levels reveals an uncanny resemblance. The first thing I noticed was the endless corridor – “Great! A common trope circulating in British D&D fandom,” I thought. This was followed by another discovery: there was that bucket again. Yes, like the one from Chimaera, this sample level also contains a bucket encounter, its “no special significance” once again sure to terrorise and frustrate the players. Then I started to pay proper attention and look closer, and noted all the other ways the two dungeons mirror each other. 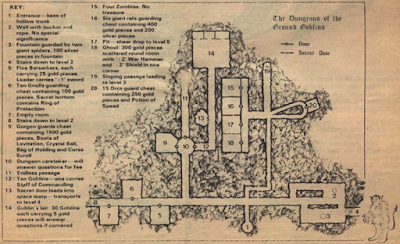 The way the level is laid out and the rooms are clustered isn’t identical, but it is eerily similar, with a southern axis connecting two downwards stairs along a linear corridor, and two main branches/room groups to the north. That room complex to the southeast is fairly blatant – you just can’t miss how similar the two versions are. There is something similar going on with a looped corridor to the east, although it leads to different rooms, and has different surroundings. There is something mysteriously described as a “space room” in Cook’s level, dropping the players down to Level 5. It is a fuzzy, irregular kind of place, although not a full-blown cavern – a small grotto off one of the corridors. The explanation is found in Jackson’s level: the transport mechanism is a “space warp”, and it leads to Level 4. The level connections are similar: there is the entrance (from a “house in the village” in Cook’s version, and the “base of a hollow trunk” in Jackson’s), two stairs down to level 2 on opposite sides of Level 1 (this struck me as a really cool feature), a sloping passage to Level 3, the “space room” to Level 5/4, and a trap door/pit to Level 7/5. The only thing that doesn’t map across the levels is a sliding door to Level 3 found in Cook’s version, and there only. The monster encounters are less straightforward to compare, but both levels have a room with a zillion goblins – in Cook’s version, there are 40 of them in room 17, guarding 100 gp and a ring of tree wishes (yikes! ), and in Jackson’s, they have a force of 30 in the large room 14, only carrying a measly 150 gp among the lot, and having some information to share. Five orcs guarding 50 gp and a +1 sword become five berserkers carrying 25 gp each, and the leader wielding a +1 sword. A powerful Wizard disguised as a harmless old man in Cook’s version crops up as a “dungeon caretaker” who can answer questions in room 10. Cook’s version has a minotaur guarding 20 gp and a curse scroll, Jackson’s has a gorgon with a pretty damn good treasure horde. It is almost certain Jackson’s dungeon level was first – the corruption of the “space room” seems to confirm it, and the dates match: it was first published in the May 1976 issue of the UK Games and Puzzles, in September 1976 in the US People’s Computers, and in February 1977 on the promo fliers seen in Jon’s G+ post. 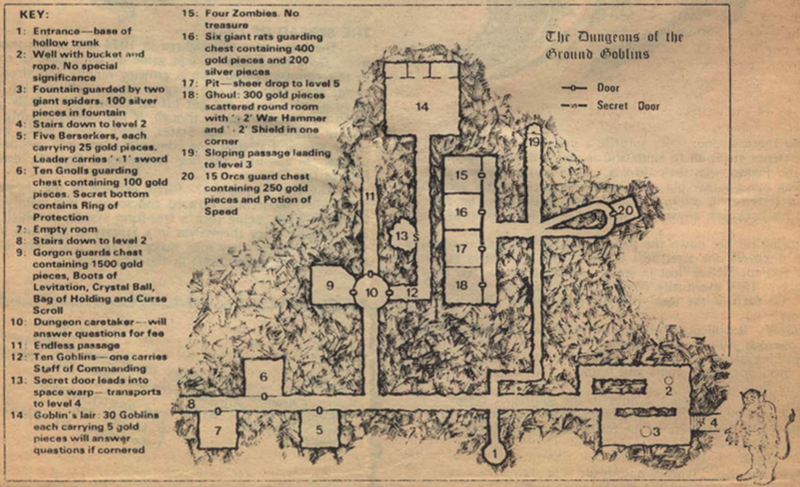 Interestingly, if Paul Cook copied his dungeon from Steve Jackson, he must have done it very quickly, as a first impression: Chimaera #18 is dated June 1976, a mere one month after the dungeon’s original appearance – but not on promo material; rather, in a general gaming magazine. Considering zine production times, it is not impossible (Chimaera had a brisk publication schedule with up to two issues a month), but it is still impressive in its own way. All in all, it is almost surely Steve’s dungeon. And yet, in an odd way, Paul Cook’s much rougher revision comes out not as a degradation, but as an improvement. Beyond the elements already discussed, Jackson’s dungeon mostly consists of monster lairs with treasure. Cook’s dungeon, on the other hand, has a shrinking room that crushes careless players, an acid fountain, the wizard-as-old-man thing, and unbalanced monster/treasure combinations which are likely the results of random generation, but are bound to be interesting precisely because they raise interesting questions. This time, the goblin lair is not to the side, but it is chock in the middle of the southern section, potentially blocking descent to Level 2 in both directions. The goblins are just numerous enough to pose a genuine risk for low-level parties, but they have an attractive prize in the form of the ring of three wishes. That’s an interesting dilemma right there. The treasures are more random, but they are also more interesting – the minotaur’s curse scroll? The orcs’ fear wand? There is something there that’s not there in the less unbalanced, but more pedestrian Jackson version. I am more interested in learning what lies under Cook’s Level 1 than Jackson’s (granted, there was probably nothing). It is also odd how this thing happened at all. 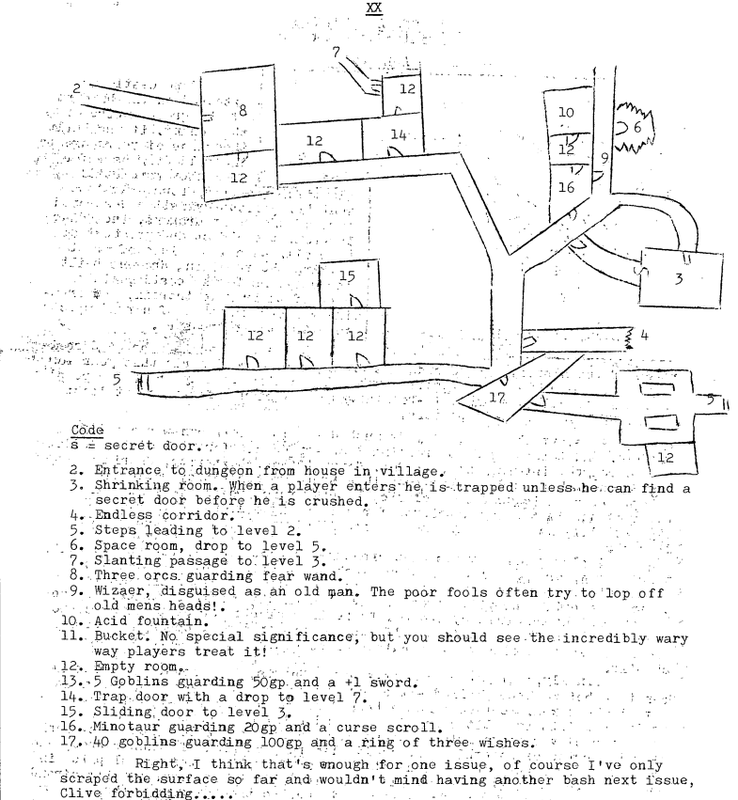 What was Cook thinking when he appropriated and republished Jackson’s much better circulated dungeon level instead of building a similar one from sketch? Was it because it had the aura of semi-official status since it was published in a real magazine? And then what about the changes he had made to the original design? It is one of the uncanny little mysteries we will probably never learn the answer to, and yet it remains fascinating over 40 years later. It is one story among many, and it is – my sincere apologies – more than just a drop in the bucket. Interesting! Always fun to trace influence. Widely distributed Sample Dungeons have legs; I'm always spotting influences of the Holmes Basic dungeon in various places from the time period. I've added a link to this blog post on my page you linked above. Well it amazes me how such measly content can evoke so deep analysis.